Imagine you're in a restaurant and it's nearly empty. You can talk to your companions, low-volume, easy and relaxed. But then more patrons start arriving and it gets more and more crowded. The noise level rises; you have to shout to be heard. There's no room to move. That's a picture of the demands on the world's communication frequency bands. Cellular phones, streaming entertainment, data communications, civil and commercial providers; they are all placing incredible strains on available spectrum bandwidth. In the electromagnetic spectrum, many NASA missions use what is referred to as S-band, and commercial businesses are putting pressure on the government to free up other bands within the electromagnetic spectrum. NASA saw this trend years ago and started opening up a new part of the electromagnetic spectrum called Ka-band. 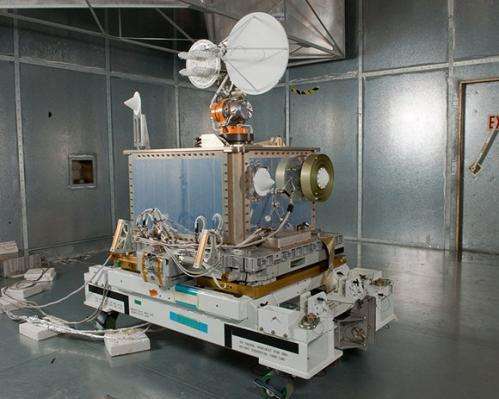 With the need to speed up transmission of high-rate science data from space missions, Ka-band, at 26 GHz, is now considered the spectrum of the future for NASA communications. Compared with S-band, Ka-band has data transmission rates that are hundreds of times faster. It's like the difference between the television antennas perched on houses decades ago that used transmission frequency called VHF or Very High Frequency and the satellite antenna dishes used today that use a much higher frequency, 50 times higher than VHF. Those old antennas worked on frequencies that delivered one channel at a time whereas the TV antenna technology of today uses higher frequencies to deliver hundreds of shows to viewers. But operating in Ka-band requires new hardware and software. Engineers at NASA's Glenn Research Center in Cleveland and the Harris Corporation developed a radio that uses software to leverage the vast resources of Ka-band. R&D Magazine recognized this design in 2013 with its R&D 100 Award. 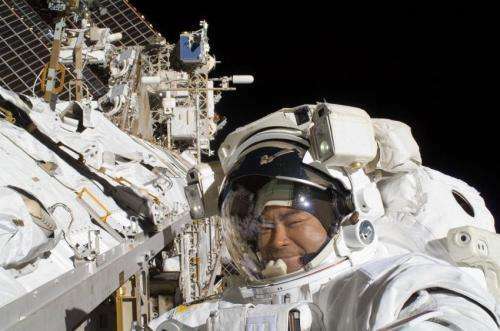 "Every mission has a different set of needs," says Richard Reinhart, principal investigator for NASA's Space Communications and Navigation (SCaN) Testbed, where these radios are being put through their scientific paces aboard the International Space Station. The testbed is being used to test and demonstrate NASA'S cutting-edge communications, networking and navigation technologies in the challenging environment of space. "Software defined radios (SDR) allow us to upload new software to hardware already deployed in space. We can extend missions, solve problems and even adapt to new science opportunities by changing and adapting new software," adds Reinhart. "Because these are signal processing platforms, or computers with an antenna, we can upload new software from the ground to change what the radio does," explains Reinhart. "It still operates within Ka-band, but we can move the signal around because the electronics enable both signal and frequency flexibility. And, for the SCaN Testbed system, we can change the data rate to anything we want between zero and 400 megabits-per-second." "Why would we want to do that? When a mission goes up, it's generally designed to run at the same data rate throughout the whole mission. But what if the transmitter starts to degrade or we detect interference? We can back the signal rate down to whatever our communications system gives us and maybe extend the mission. Maybe an antenna doesn't deploy enough; we can figure out what is left and change the software to accommodate whatever the system gives us," says Reinhart. While there are a few missions sending data on Ka-band direct to Earth stations, the SCaN Testbed's radios are the first NASA mission to transmit through the Tracking and Data Relay Satellite (TDRS) system, a constellation of NASA communications satellites. The advantage of this system is that data can be communicated from space to Earth 24 hours a day; whereas direct to Earth can only occur when receiving stations come in line with a direct satellite signal. Ka-band radios on the SCaN Testbed will be tested through 2016. "The goal is to exercise the radios every day to show that use of software-based systems and the risk of doing reconfigurations on orbit is low," says Reinhart. Reinhart and his team at Glenn are demonstrating that SDRs operating in Ka-band can cut through the noise of constant communications and quickly deliver vast amounts of data through highly flexible communications architectures to speed scientific discovery. NASA Unveils New Antenna Network in White Sands, N.M.